The Office’s John Krasinski visited David Letterman tonight. With more than 450 votes were tallied, here are your winners of the ‘Michael Scott in the Wild’ Contest! Congratulations to the winners Katri, Brandon, and Brigette, and thanks again to all who submitted entries. 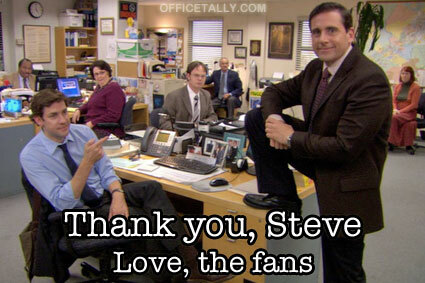 And thanks again, too, to Cathy, who created the Michael Scott doll! Even though the official NBC press release states that tonight’s episode of The Office is supersized to 50 minutes, my TiVo actually states 52 minutes. Plan accordingly! 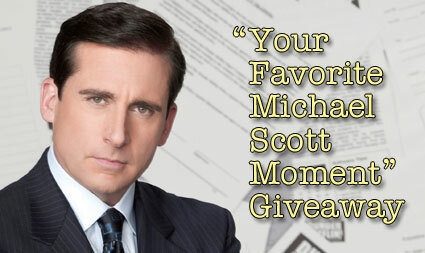 ‘Goodbye, Michael’ airs tonight 9/8c NBC; it’s preceded by a re-air of ‘Garage Sale’ at 8:30.